I love scrapbook paper (even though I don’t scrapbook–go figure). I also have a long time love of decoupage. Paper and glue just go together and I have been combining the two as long as I can remember. It is also easy enough that the kids can help. They like to “paint” the glue on for me. A spring craft-a-palooza is about to start here in the corner so I thought I would share some of the ideas that are fueling this decoupage fever. 1 Sometimes a little bit goes a long way as you can see from the Modge Podge Rocks Blog! 2 This cute trio from Craftown has a message. 3 This tutorial from 1st Bar features a pretty fabric covered pot. Fabric is a little pricier than scrapbook paper but if I find the right print, it would be worth it for this look. 4 Using Napkins and modge podge gives this pot a dreamy romantic look. Though I am not going for romantic in the kitchen, it would be beautiful in the bedroom. 5 This beautiful tutorial from With a Dash of Color using modge podge to transfer an image is breathtaking! I am going to try this when I plant some flowers by the pool. There are a ton of neglected pots out back just waiting for this! 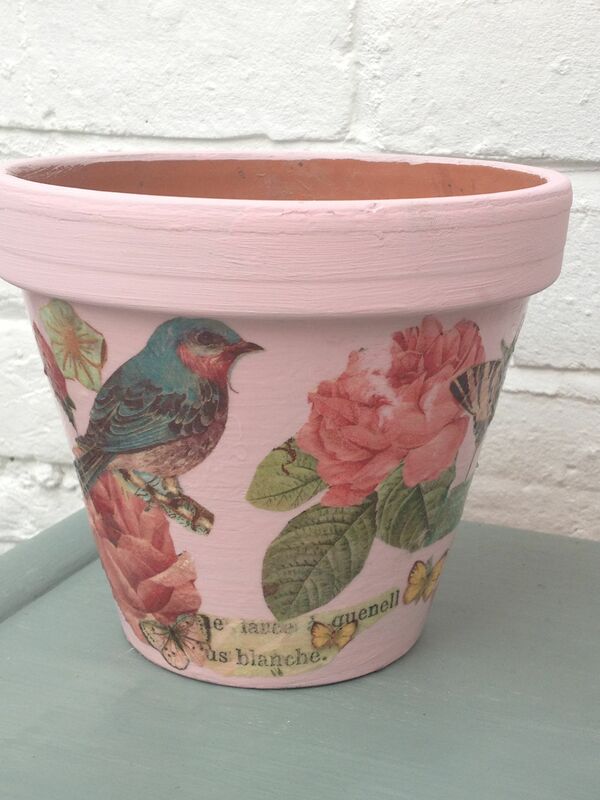 6 How to Decoupage Flower Pots from Petite Planet. This cute tutorial is exactly the kind of look I am going for in the kitchen. My plan is create a cute spring vignette on our bay window sill. 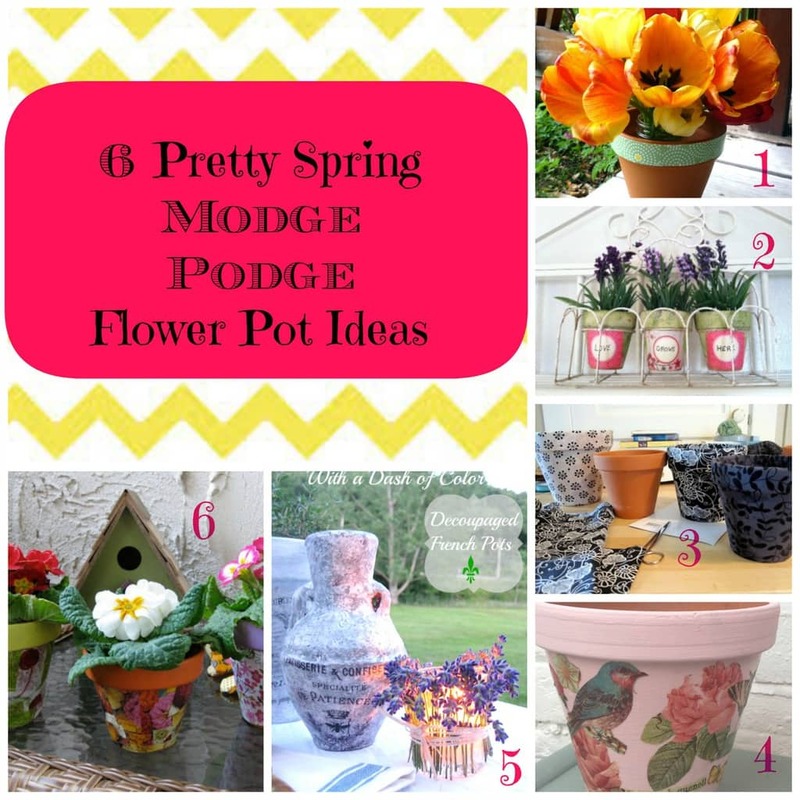 These crafters came up with very different, but equally inspiring versions of the modge podge spring flower pot. I can’t wait to find the perfect paper or fabric and show you my version next week! Cute! Especially number 4! But I just know I will not have the patience to do this LMAO. But they would be nice for plant gifts! Jhanis recently posted…When hell breaks loose, blame it on the tooth fairy. Come on Jhanis! Try it the craft. I want to see how it turns out for you lol. I freaking love mod podge! You think if I had a pretty pot people won’t notice that my flowers are wilting or dead? LOL I do not have a green thumb at all. waah!